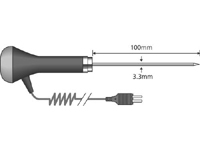 The Comark C26 Type T Sensor Thermometer is ideal for catering and food industries due to its durable housing the Comark C26 Type T Sensor Thermometer is waterproof to the IP67 standards and have an integrated protective rubber boot. The Comark C26 Type T Sensor Thermometer can be mixed and matched to any Comark probe to customise the use of the thermometer to the requirements of the operator. The permanent clock and count-down timer assists the catering industry to have awareness of their timing when watches are not permitted in the kitchen.